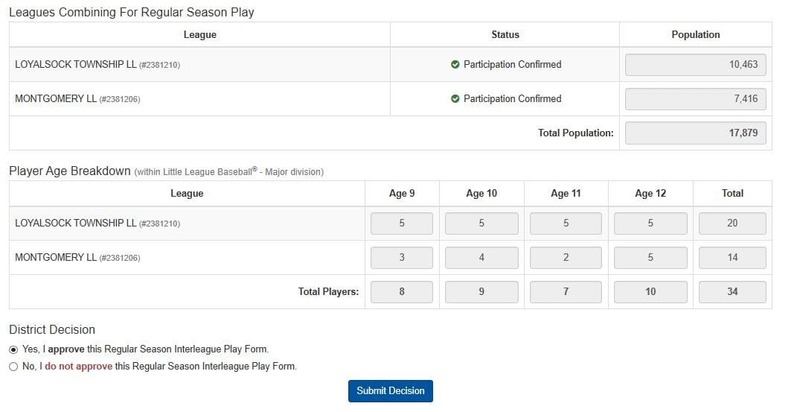 When a local league submits an Interleague Play request through the Little League® Data Center, the process for reviewing and considering the proposed arrangement involves a few simple steps. Provided below are instructions and visual descriptions taken from the Little League Data Center that will walk you through the Interleague Play review process. Please note that Interleague Play Requests are for the regular season only and approval of such requests does not grant approval for Little League International Tournament team combinations. Leagues may request to combine for Tournament through the Data Center (available April 2019). More information about the process that leagues must follow to submit an Interleague Play Request is available here. To view forms that are ready to be reviewed, click the “Regular Season Interleague Play Forms” link in the “Your To-Do Items” section of the Data Center landing page. To approve or reject an interleague request, click the “Approve/Reject Form” button. Incomplete forms can be viewed, but not approved. To approve or reject an Interleague Play request, click the applicable button found under the District Decision heading after reviewing the request. Please note that the population information for each league is pulled directly from the mapping system and is based on census data. If all leagues involved are within your district, no further action will be required. If leagues are involved from multiple districts, all District Administrators and the Region must approve the request. Once approved, you may view Interleague Requests in the League Forms section of the Data Center.